Greek and Turkish Cypriot leaders have reached a landmark agreement on peace talks, paving the way for a referendum on reuniting the divided island by May. They have handed UN Secretary General Kofi Annan the power to finalise the referendum terms - even if the two leaders cannot themselves agree. The deal came after three days of UN-hosted "talks about talks" in New York. Formal talks will now move to Nicosia, where efforts to bring a united Cyprus into the EU on 1 May will continue. If the process fails - or if either of the communities rejects the plan - membership of the EU will in effect apply only in the Greek Cypriot south. "I commend the constructive spirit and political will displayed by both parties, as well as by Greece and Turkey, to reach this agreement," Mr Annan told reporters in New York. "All concerned now face historic responsibilities to bring about a just and lasting peace in Cyprus." He also thanked Greece and Turkey for their help - but stressed they had not solved the issue yet. "This is the beginning of the process," said Turkish Cypriot leader Rauf Denktash, who ended the last peace round by walking out. Acting Greek Foreign Minister Tassos Yannitsis called the agreement historic. "This day opens a new historic opportunity for the resolution of the Cyprus problem," he said in Athens. "This means that we are disentangled from the stalemate. This justifies the steady and determined position that the government and the Greek Cypriots took within the UN process." Mr Annan's plan lays out a three-stage process to overcome any possibility of deadlock. First, talks between the two Cypriot leaders will reconvene next Thursday in Nicosia, the island's divided capital. If they cannot reach an agreement by 22 March, negotiators from Greece and Turkey will step in. If there are still unresolved issues by 29 March, Mr Annan will finalize the text to be put to referendums on both sides of the divide in Cyprus on 21 April. Previous UN-backed talks have failed repeatedly since the 1970s. The last round collapsed nearly a year ago when Mr Denktash walked out. 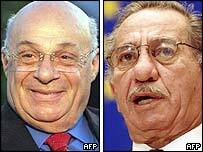 The Greek Cypriot leadership also disagreed with key aspects of the UN blueprint. Mr Annan's blueprint calls for a single state with Greek and Turkish-speaking regions linked through a weak central government. Unresolved issues include the powers of the central government, the number of Greek Cypriot refugees to return to the north, land concessions and the number of Turkish troops on the island.